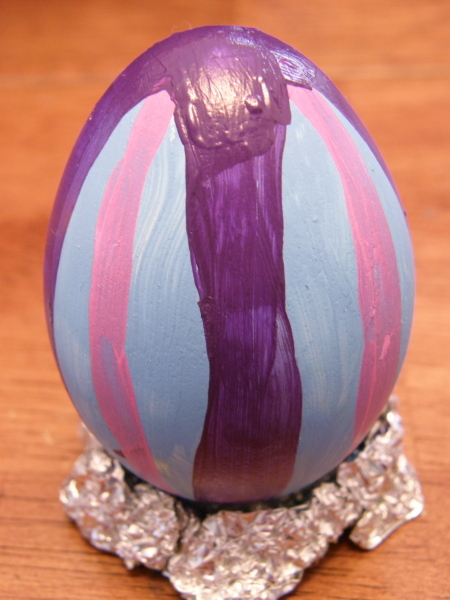 This year we decided to do a little more grown up version of egg coloring and so hand blew and painted one egg each. It was really pretty fun! Let me tell you though, that blowing the yolk out of an egg takes a bit of effort, lol. If you’re at all susceptible to head aches (which, of course, I am!) you might want to make the hole on the bottom of the egg a bit larger and use a pokey thing (we used a cake tester) to help release the contents just a bit easier. 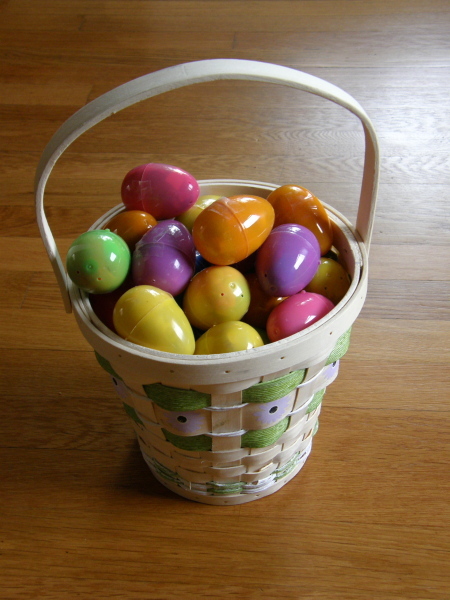 Also… be sure to be careful not to squeeze too hard with your fingers while blowing, so that you don’t accidentally crush your egg in the process! We did have one egg casualty, but that was from the egg rolling off the table and onto the floor while gathering our supplies. 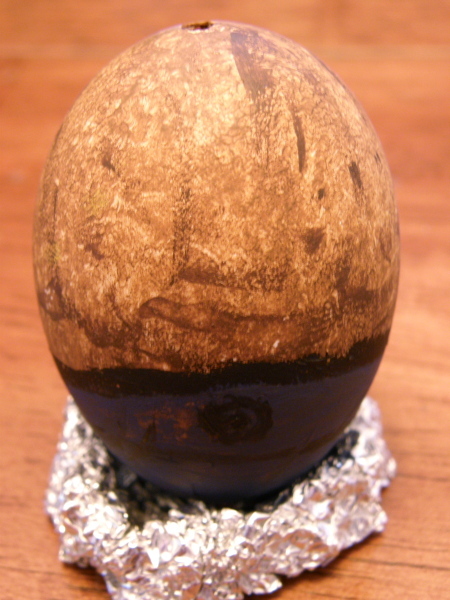 😛 We figured it might be easier to keep the eggs safe if we formed little stands with aluminum foil to help keep the eggs upright during the draining and painting process. 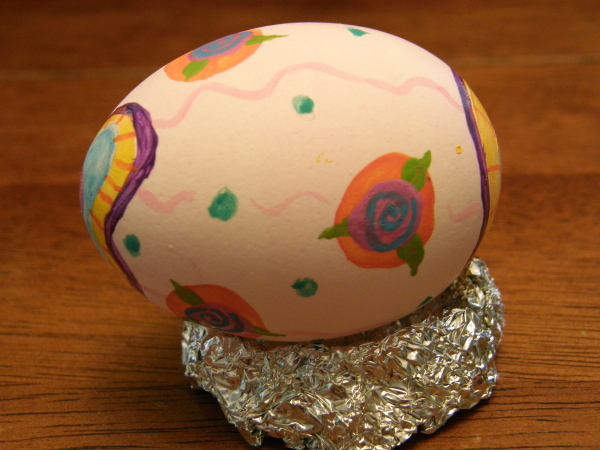 Once the eggs were completely drained, we used a combination of water color and acrylic paints to decorate. Mine is just floral and stripes on a soft pink wash… lots of colors, as is usual for me, lol. My younger daughter’s is a classy show of bold stripes on a pastel background. 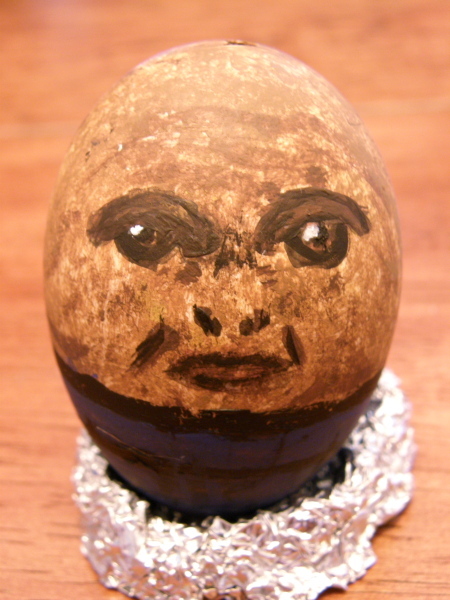 My eldest daughter got really artsy and created a Sontaran from Doctor Who! We’ve really been into this series lately, and the egg shape was just too hard to resist for my girlie, lol! 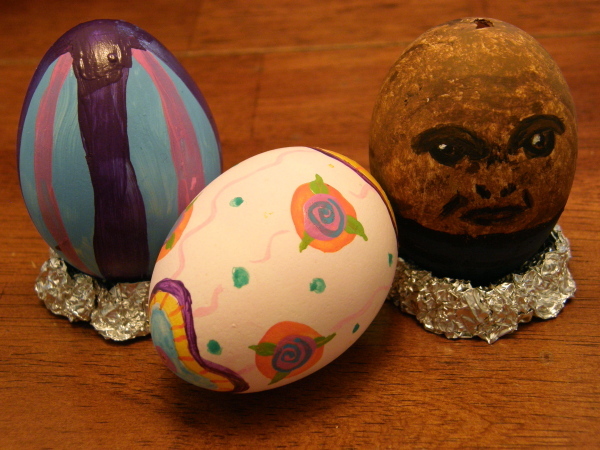 I hope that you all had a fantabulous Easter weekend as well! btw: Stay tuned for the grand opening of the new line of Gettinitpegged Gear, hopefully launching tomorrow!!! 😀 …and don’t forget the 50% off Spring Sale for patterns in the Peggin’ Pages through this Sunday! Happy Looming! This entry was posted in Crafting, Family Fun, Gettinitpegged Gear, Holidays, Loom Knitting. Bookmark the permalink.